Pesticide exposure, climate change, and habitat loss have created a toxic cocktail that is harming populations of pollinators critical to sustainable agriculture and food security. Simultaneously, millions of tons of topsoil are lost annually due to wind and water erosion, causing what acclaimed Cornell professor David Pimentel refers to as “one of the most serious environmental and public health problems facing human society.” But with today’s Federal Administration and Congress, how can these problems be meaningfully addressed at scale? At this crucial time in the health of our planet, Minnesota-based Fresh Energy has demonstrated success in pioneering a win-win-win solution for the health of our long-term energy system, threatened pollinators, and our soil. The key? It’s growing right under the solar panels. In the last nine years, the price of new solar development has fallen by more than 85 percent, and battery prices are falling even faster. More and more churches, towns, cities, co-ops and businesses are choosing to save hundreds to thousands of dollars by getting a percentage of their electricity from the sun. Farmers are loving it too, as they lock in long-term revenue from leasing a portion of their land for a solar farm. In some places, rent can range from $500 to $1,500 per acre, per year. As solar goes from less than one percent of our electricity mix to more than 20 percent, analysts forecast that farmers will lease more than three million acres of land for solar, resulting in a potential $1 billion to $4 billion in increased income for U.S. farmers each year. But these solar farms don’t have to be seeded with turfgrass—in fact, we already have more than 40 million acres of turfgrass lawns in the United States. We don’t need more. Instead, solar farms of all sizes—even big, sprawling ones—can be seeded and managed to establish perennial-flowering, pollinator-friendly meadows. Flowering vegetation on solar farms is a once-in-a-generation opportunity to direct private sector investment to meaningfully help pollinators and improve soil health. As quail and pheasant hunters know all too well, in the last 20 years we have lost more than 10 million acres of conservation land, contributing to ominous population declines across several species of birds, pollinators, and other wildlife. In addition to providing forage for the beneficial insects we depend on for food security, a pollinator-friendly landscape will also help agricultural soils. A first step in improving soil health is reducing the amount of topsoil lost to wind and water erosion. 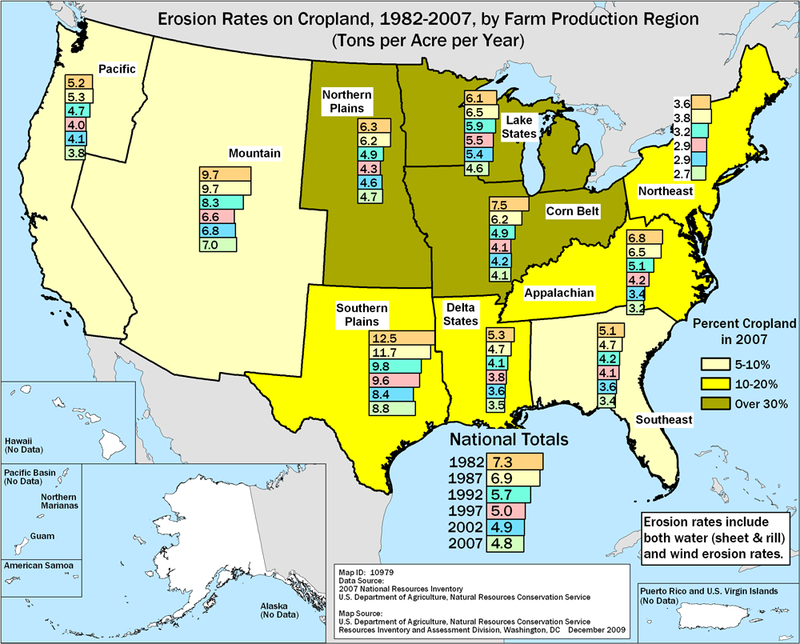 According to the USDA, the U.S. lost, on average, 2.7 tons per acre up to 8.8 tons per acre -- per year -- between 1982 and 2007. It’s worth reiterating: That’s tons. Per acre. Each year. Pollinator-friendly solar is one way to slow or eliminate those losses. A diverse mix of deep-rooted grasses and flowers holds soils in place, breaks up compaction from solar construction, and increases soil organic matter. Improved soils allow microorganisms and soil fauna to recover after potentially decades of pesticide and fertilizer application. And the perennial grasses and flowers attract beneficial insects and birds to the farm, which reduces the farm’s need for pesticides. With grassroots partners and many of the nation’s expert entomologists, the Center for Pollinators in Energy at Fresh Energy has led or advised on the creation of standards for what constitutes “pollinator-friendly” in the context of the managed landscape of a solar farm. When a product is promoted as “organic,” consumers expect it to meet the USDA Organic standard, and similarly for solar farms, it’s important that entomologists inform the standard as to what’s good for bees. Crops including alfalfa, cranberries, strawberries, pumpkins, blueberries, and cucumbers can be produced outside the fence of a solar array and significantly benefit from the pollinator habitat around and under the panels inside the fence. And the diverse vegetation on a pollinator-friendly solar farm is terrific forage for honey bees, providing added value to beekeepers. In the photo below, a beekeeper from Bare Honey harvests honey from managed hives near a pollinator-friendly solar array. The land is also excellent for rotationally grazing smaller breeds of sheep, whose grazing action would keep invasive species under control, help sunlight reach the soil to stimulate new growth, and naturally fertilize the area with their manure -- all of which also circles back around to benefit pollinators. A beekeeper from Bare Honey manages honey bee hives on a pollinator-friendly solar farm. 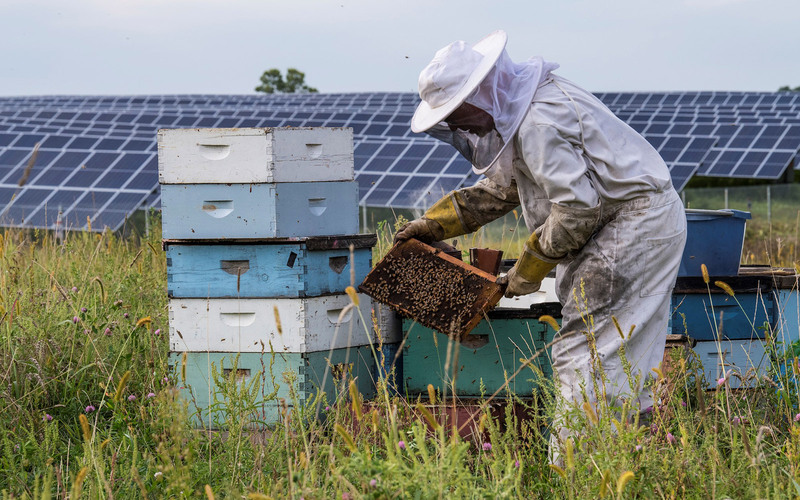 Along with Clif Bar, University of Minnesota, Cornell University, and others, Organic Valley is a partner in research to learn more about best practices for pollinator-friendly solar farm design and management. The research is led by the National Renewable Energy Laboratory and funded by the U.S. Department of Energy. Looking forward, savvy solar development partners are taking the lead and making meaningful progress. At Organic Valley’s campus in Cashton, Wisconsin, the cooperative has broken ground on a solar array that will incorporate perennial agriculture and grazing practices. And just a few miles down the road, electric utility Dairyland Power has a beautiful portfolio of low-maintenance pollinator-friendly solar farms—scoring from 80 to 95 on pollinator-friendly solar scorecards—and their leadership is being recognized more and more as the common sense, smart way to do solar. It is encouraging to see pollinator-friendly solar projects underway in Minnesota, Oregon, New York, Georgia, Idaho, Vermont, Nebraska, Illinois, and Texas. More solar is coming to your community—and with your engagement and support, these projects can establish acres of flowering landscapes to benefit our pollinators and so much more. As director of Center for Pollinators in Energy at Fresh Energy, Rob Davis helps accelerate the nation’s transition to the use of clean and renewable energy. Davis’s work on pollinator-friendly solar has been highlighted in Scientific American, Fast Company, and in trainings by the U.S. Department of Energy, and he presented at TEDxMinneapolis in 2017. He can be reached at davis@fresh-energy.org.